Earlier today, ComicBook.com exclusively debuted a number of solicitations for June's new DC Comics launches -- and they were full of information about just what life is like after Convergence in the DC Universe. 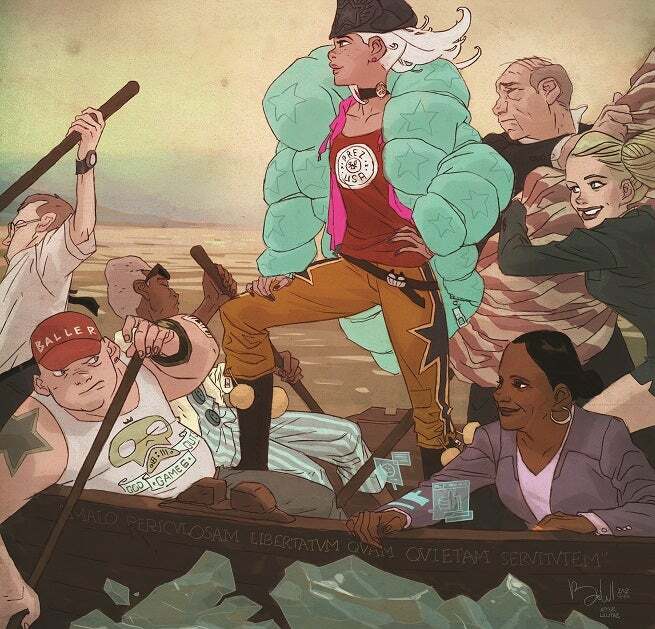 It's a very different place, with June and July being described by many as a "soft reboot," dozens of new titles hitting the market and the New 52 branding officially dropped. Turns out Guy Gardner is joining the Justice League in the far-flung future...but he won't look quite the way you remember him. 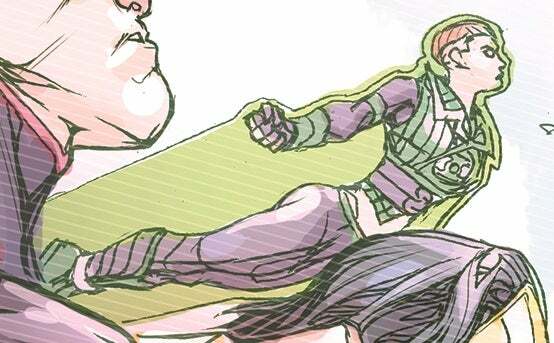 Guy is looking very...female...in that image, and given that this is the Giffen/DeMatteis version of the character, it's unlikely he'll cope well with whatever mishap it was that mixed up his DNA when he was brought to the future. With a first issue whose cover echoes Washington Crossing The Delaware, it would have been a safe bet that Prez would have some revolutionary themes, but they make it pretty explicit with the carving on her boat -- "Malo periculosam, libertatem quam quietam servitutem" -- something that was added for Prez, as the inscription wasn't on the original painting. What's that mean? Well, it's a Latin phrase invoked by Jefferson that means "I prefer dangerous freedom over peaceful slavery." What's more antiquated -- Latin, or the notion that Twitter will still be a thing however many years in the future this comic takes place? DC co-publisher Dan DiDio hasn't been shy about the fact that, love them or hate them, the '90s still move units. It was a time when comics sold in the hundreds of thousands on the regular, and DiDio has reasoned since the 2011 relaunch that if you can get a piece of that pie back, it's worth exploring. So...we get Doomed, which takes Doomsday, the villain of arguably the biggest and most iconic story of the '90s, and essentially gives him his own title, using the twist that Doomsday can be "transferred" to people, as we saw in All-Star Superman and on Smallville. That comic comes from Scott Lobdell, writer of the Superman: Doomed! storyline from last year and one of the most popular writers of the '90s. 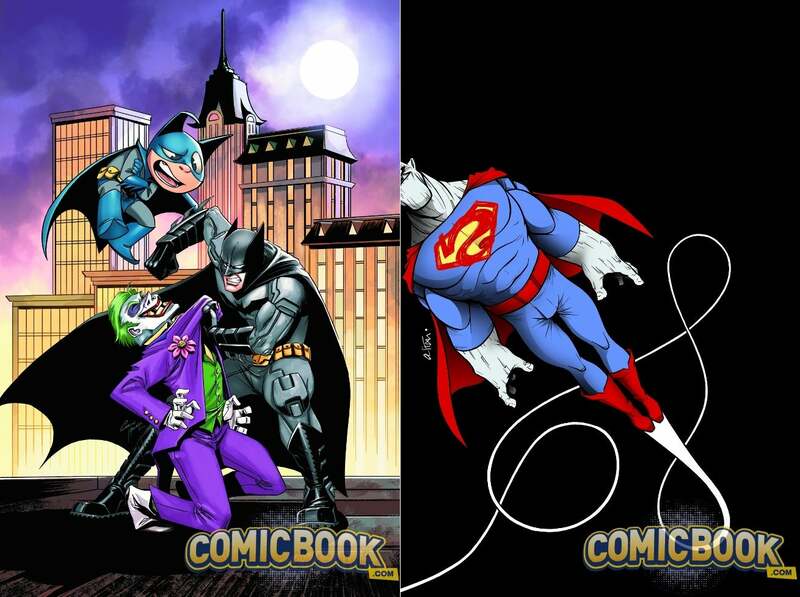 Both Bizarro and Bat-Mite are rated E, marking the first time since the launch of the New 52 (and likely well before that) that all-ages titles have made their way into the main publishing line. 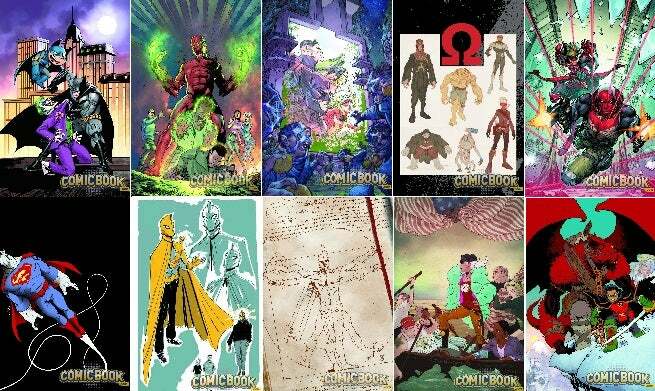 We're assuming that these books will be "canon," suggesting that DC's idea of a more "inclusive" universe for readers is starting to spread beyond just the occasional non-white, non-male hero and into an overall broadening of definitions of comics readers. Bat-Mite believes he's responsible for Batman's success, and wants to spread the wealth around to other characters? Well, it's hard to guess just who might guest-star in this series, but one thing is for sure: that setup is fraught with possibility, not least of which is giving a Bat-bump to some characters who could use some more visibility. That certainly seems very meta...! 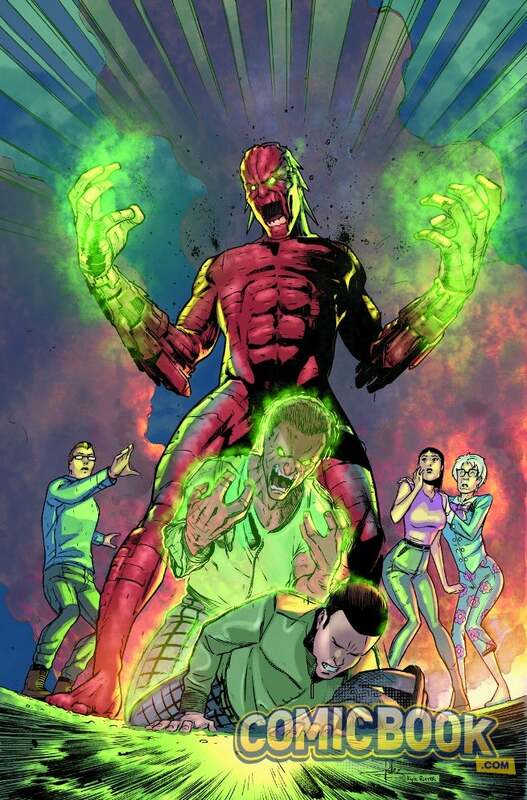 In addition to Doomed, we'll be introduced to another new character in the form of Dr. Fate. This isn't the Dr. Fate who's been appearing in Earth 2, so all bets are off as to just what his deal will be. Of course, that's not to say that it might not be the Prime Earth corollary of the same character, since they don't name the new Fate at all. 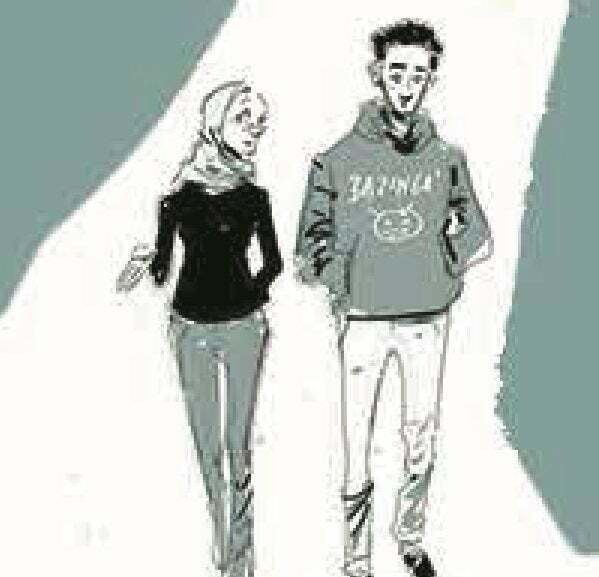 We can see from the image at left that he and his companion look like they might be Middle Eastern, but even that is just assumption based on some rough physical characteristics and the woman's head covering. Who is he? Well, "An overwhelmed Brooklyn med student who’s been handed the helmet of Fate, without an instruction manual." Apparently Kyle Rayner has been murdered and the Omega Men are responsible. Not sure how that works out, but it's an interesting setup for a series, for sure. It feels a bit like back during Countdown when they had the Rogues starring in a storyline that basically revolved around running from superheroes angry that they had killed Bart Allen. ...Of course, while Countdown was an unmitigated disaster, that premise had some promise and it was just hampered by execution problems, so maybe that's on purpose. 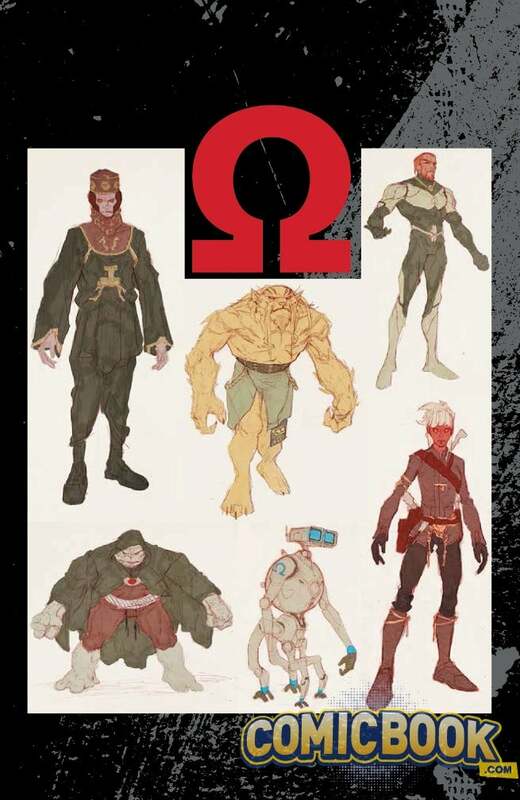 If I had to guess, Kyle isn't really dead and is working with the Omega Men in some way, which would make sense given that Green Lantern: New Guardians, the Kyle-centric title in the family, is one of the ones ending this month. In any case, Omega Men jumped to the top of a lot of people's must-read lists with this solicitation, even if it's just so Kyle fans can rage at the book. This isn't the first time the idea of putting the psychic, shape-shifting Martian Manhunter into a spy setting has come up, but certainly it seems like they're really going for it this time in a way they haven't in the past. Surrounded by other foes with similar abilities, J'Onn's title sounds like it could be a paranoid suspense/espionage story that is a really cool take on the character...and very different from what DC has done with him in the recent past. 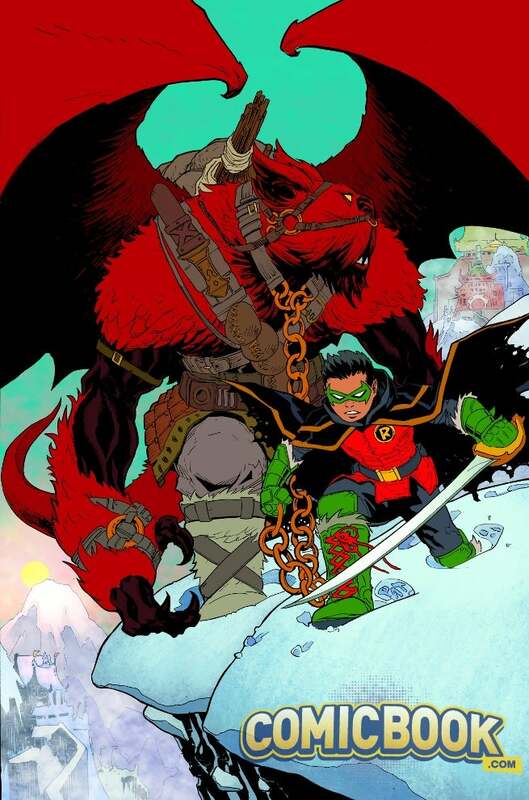 Robin, Son of Batman really looks like a Boy and His Dog kind of story...featuring something called Goliath? I'm guessing it's a reinvention of the villain we saw back in Red Robin, but it doesn't look like him...or like any other Goliath we've seen in DC Comics. It kind of looks like if Red Hulk and Man-Bat had a baby.